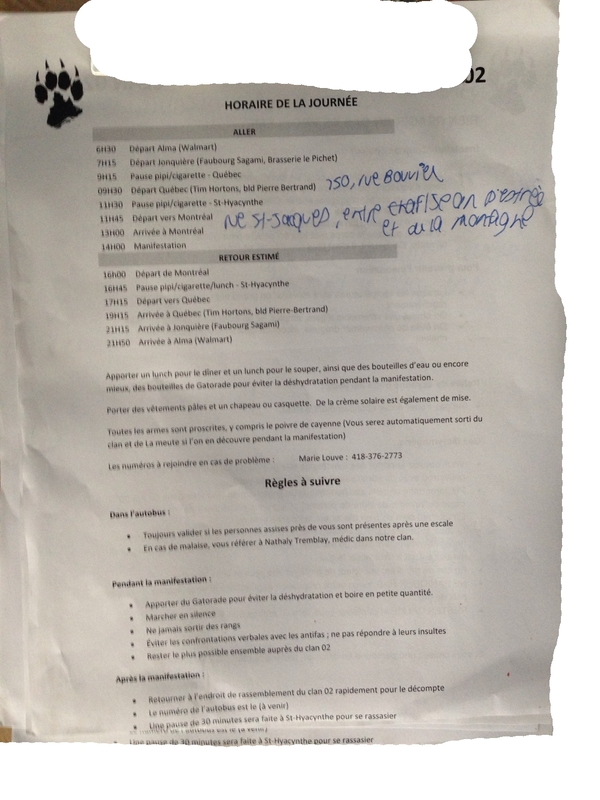 On July 1st, La Meute, Storm Alliance, and a new group called “Independence Day” planned to converge in downtown Montreal and march against “illegal” immigration, in what La Meute promised would be a demonstration of “historic” proportions. Thanks to a coordinated response from local antifascists, antiracists, anarchists, communists, Indigenous and anticolonial activists, migrant justice groups, and concerned citizens, what it ended up being was a historically colossal failure. 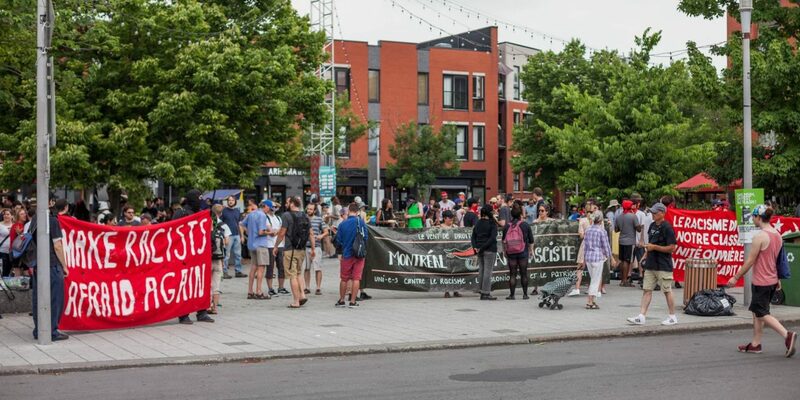 This was La Meute’s first attempt at a demonstration in Montreal since March 4, 2017 – and this time, they weren’t able to parade their vicious, hateful rhetoric through the streets. Antifascists faced a number of logistical challenges. 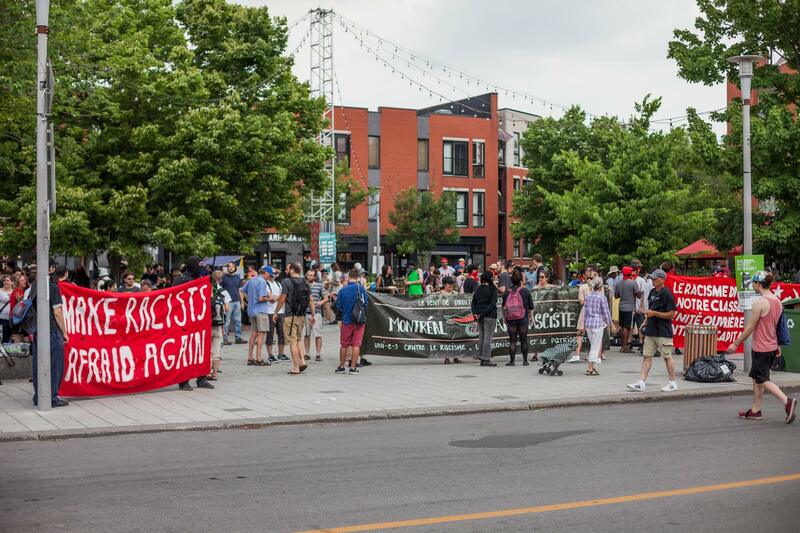 The racists had stated on social media that they would be meeting in “the east of Montreal” and leaving from there to their march, but that they would only announce the precise details the morning of their march. 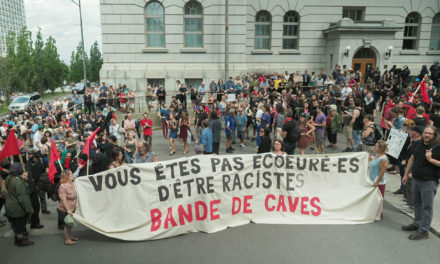 The antiracist demonstration was called at Place Simon Valois not far from Joliette metro, an area considered “home turf” for the radical left, and which it was hoped could be used as a staging area to head further east if necessary (the assumption was that the far rightists would be meeting at Radisson). 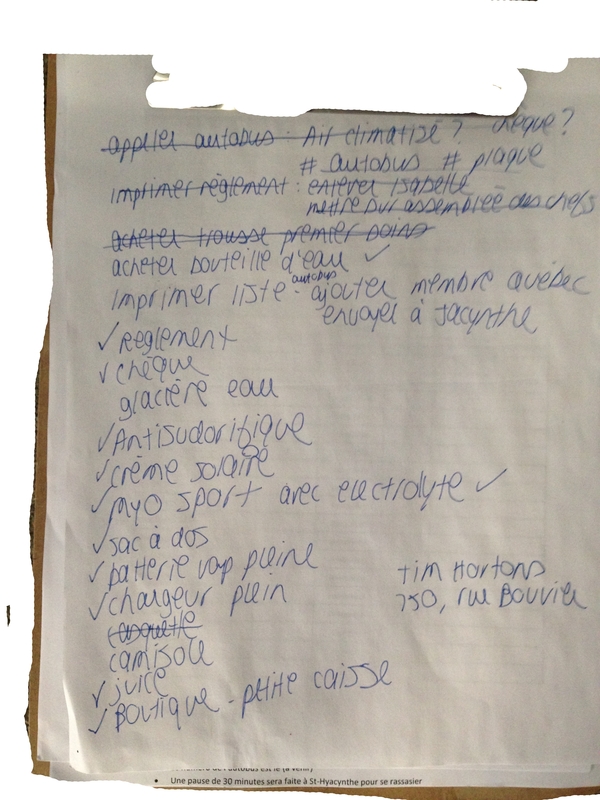 It looks like the whole thing about “east of Montreal” was likely disinformation on their part, as they in fact met at Bonaventure metro in the west of downtown. 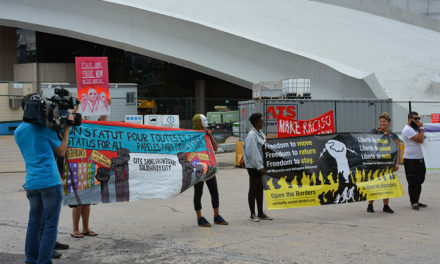 On very short notice, the antiracist forces arranged to have metro tickets on hand, and after a quick rally at Place Valois with speeches from Montreal Wolf Pack (an Indigenous street patrol) and local antifascist organizers, headed to Joliette to take the metro west. Between 200 and 300 hundred people had turned up at Place Simon Valois, and roughly 200 made their way to where the far rightists were meeting. There was some confusion – which was the fault of the organizers – about the nature of the antiracist rally. On social media it had been announced that this was not going to be a counterdemonstration, however those who showed up to organize the event and most of those at the rally wanted to confront the far right head on. That’s why people decided to move to Bonaventure. 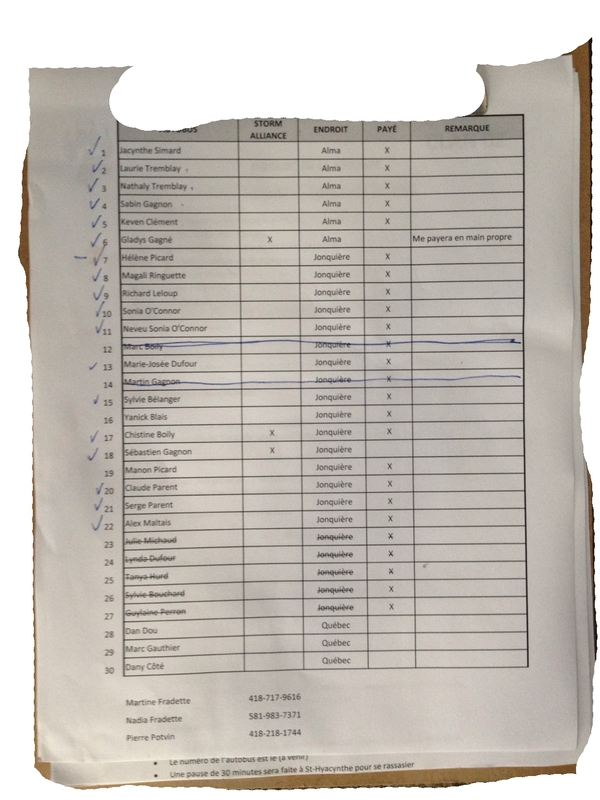 To anyone who showed up expecting a separate demonstration against racism, and who was disappointed when it became a counterdemonstration downtown, we offer our apologies. 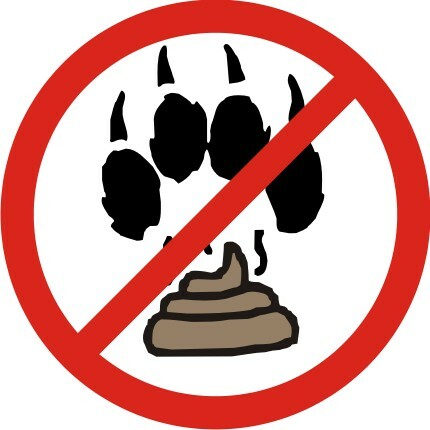 We will attempt to do better at communicating in a consistent and accurate way in future. It is also important to note that we suffered from very limited human resources when organizing on our own side. July 1 is a horrible day to organize a demonstration in Montreal, as so many people are moving that day. The left also relies heavily on student forces and networks which are absent during the summer. And finally, antiracists were already mobilizing that week (and that day) to go to communities close to the border in a “Refugees Welcome Caravan.” While we did the best we could given a very small number of organizers, certain tasks fell by the wayside. One result of this was that, despite our victory on the streets, we were unable to properly put forth our own politics in the media reports that followed. Next time we must do better. Despite these challenges, on the day itself, once we arrived downtown, it became clear that we significantly outnumbered our opponents. Somewhat spontaneously, our forces split in two, boxing the racists in behind the lines of police protecting them. What followed were several hours of sweltering heat (the hottest July 1 on record in Montreal) as we kept the far rightists immobilized. Big props to those who held their ground in the hot sun, to those who took the initiative to go get water for the crowd once the water the organizers had brought ran out, and to those who took the lead in chanting antiracist, antifascist, and anti-colonialist slogans to keep the crowd’s spirits up. La Meute would later try to claim that their march was a success, despite only 100 or so people having showed up from across Quebec, because they managed to walk a half a block to their first target before we showed up (the offices of Immigration Canada, which were closed that day). 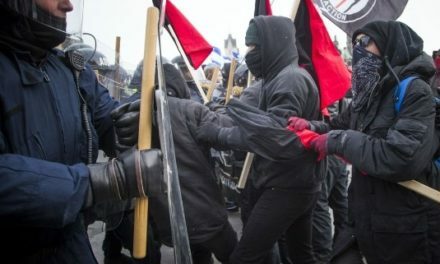 A look at their comments in their private groups, however, shows the truth of the matter, that they had intended to march and had been blocked by our forces, as they had been relying on the police to contain or attack antifascists (as they had done in April in Montreal and in November in Quebec City). When this didn’t happen, they had no plan B, and in what is becoming a La Meute tradition, spent most of the afternoon seeking escape from the heat in a nearby parking garage. 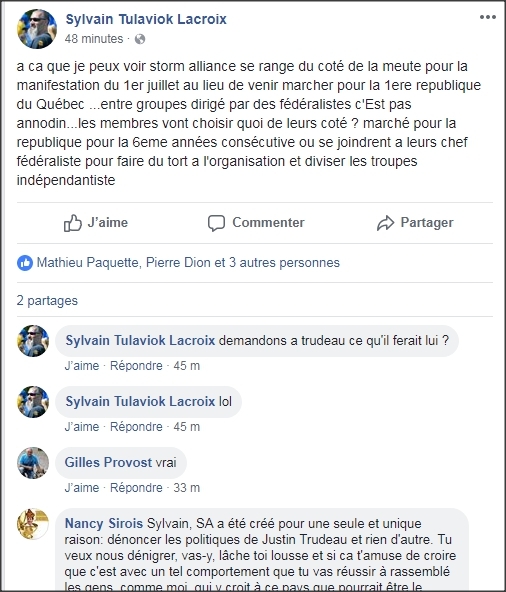 As for Storm Alliance, so few people showed up that leader Eric Trudel ended up berating his own people in a post-march facebook video for being all talk and no action. We don’t know what Trudel was on at the time (though note the constant sniffing of his nose during the video), but this rambling attack on his own people just made him, and Storm Alliance as a whole, look all the more like clowns. The group has certainly not recovered since its founder Dave Tregget quit last winter. Many factors contributed to our success in blocking this attempted racist march. First and foremost, the success was not strictly ours, but was in fact the success of the Montreal radical left, which contains many divergent tendencies, and which has many serious disagreements, but which came together for this and cooperated in exemplary fashion. Antifascists are part of a broader movement with a deep and rich history in this city; we can only win when we remember this fact and draw upon these forces. 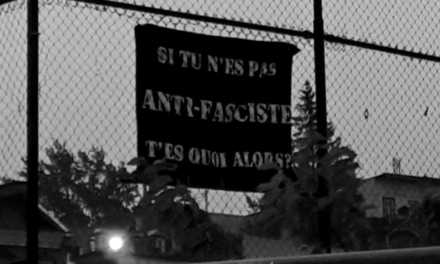 Secondly, our antifascist movement itself has now had over a year since La Meute’s first public outing in Montreal to learn from its past mistakes – where our movement was once a loose, disorganized network of groups who had little to no communication with each other, we are now much more effective in our ability to coordinate actions. 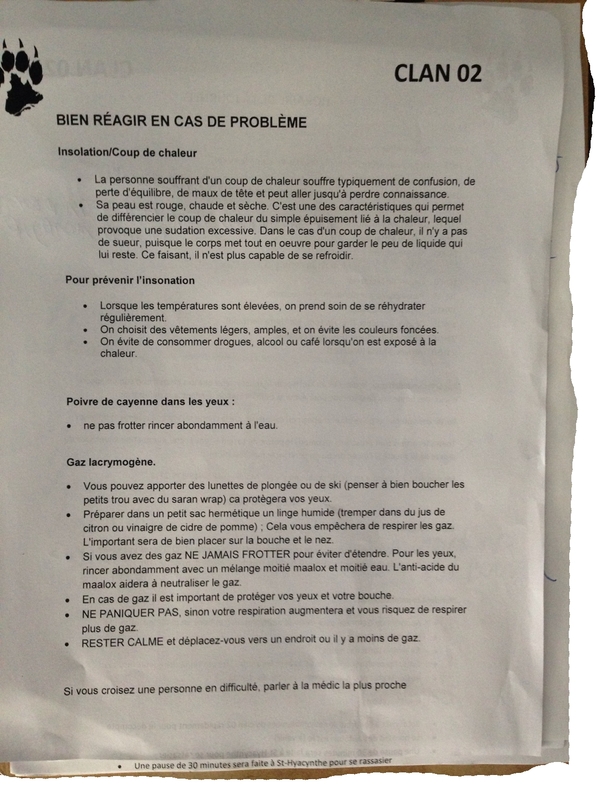 Thirdly, it needs to be mentioned that La Meute’s own forces were incredibly poorly organized that day, even without consideration of the intense heat – they forgot their water and signs in the car, seemed to be relying on the police to practically conduct their demo for them, and one member even lost a list of all of their Clan’s attendees and then failed to even warn their members about this slip-up until antifascists found the documents and uploaded them for all to see. Another important factor in our favor, recent interventions by local Montreal activists had brought media attention to the fact that police have openly sided with the far right at numerous demonstrations over the past year; this in turn created a situation where the police were under pressure to not embarrass their bosses by too openly siding with La Meute this time around. Finally, it must also be noted that far right forces were divided on July 1. 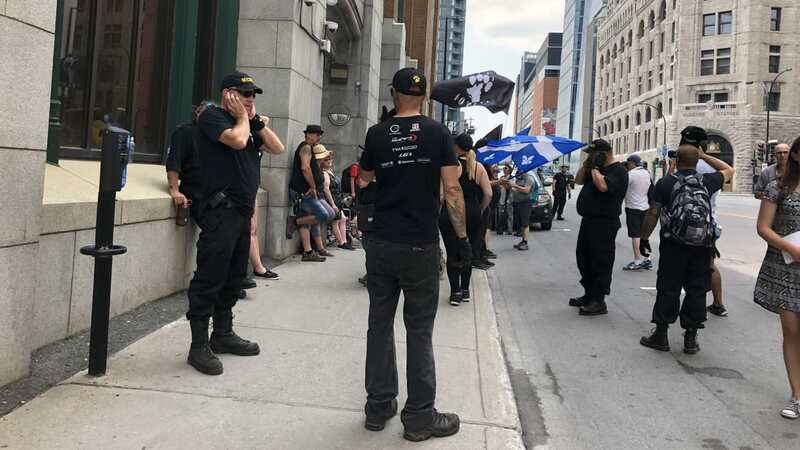 While Storm Alliance and Independence Day joined La Meute’s march, another small far right demonstration was making its way unimpeded through the streets of Montreal. 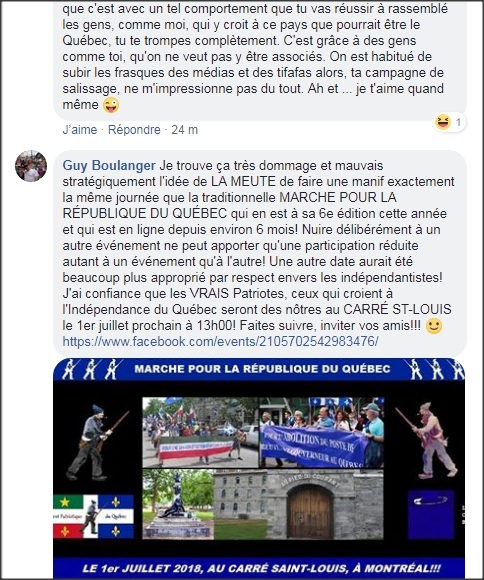 The Front Patriotique du Quebec – a small star in a larger constellation of racist forces for whom Quebec independence is of primary importance – has held a “Rally for a Republic of Quebec” every July 1st for several years now. The FPQ did not take kindly to La Meute calling an anti-immigrant rally at the same time as their annual march. While there have been calls for “unity” on the right, these have been surpassed by the attacks on La Meute for being a “federalist” group. 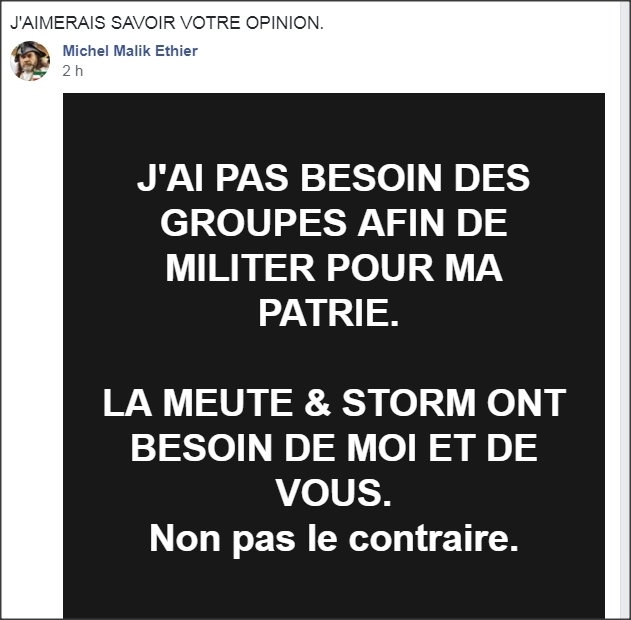 In short, many nationalists, including racists and far rightists in the nationalist camp, increasingly see La Meute as an unreliable and arrogant group built up by the media but unable to mobilize any substantial numbers on the ground. 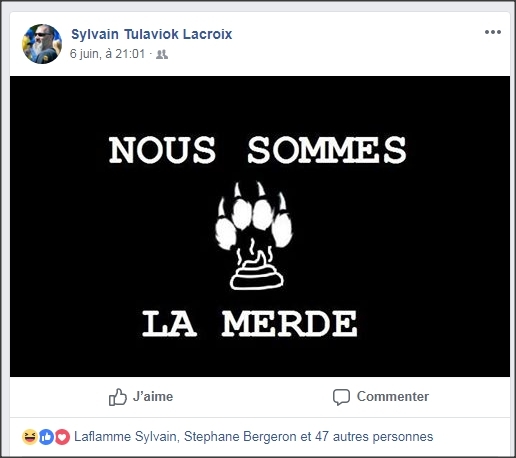 Indeed, giving credit where credit is due, the “La Merde” image antiracists used on social media and posters for July 1 was in fact borrowed from Sylvain Lacroix, the former FPQ member close to the Three Percenters, who is himself now trying to set up a far right militia in Quebec. Those who whined online that this image was “anti-Quebec” should get a grip: the image came from your own side, and from the nationalist section of your side at that! 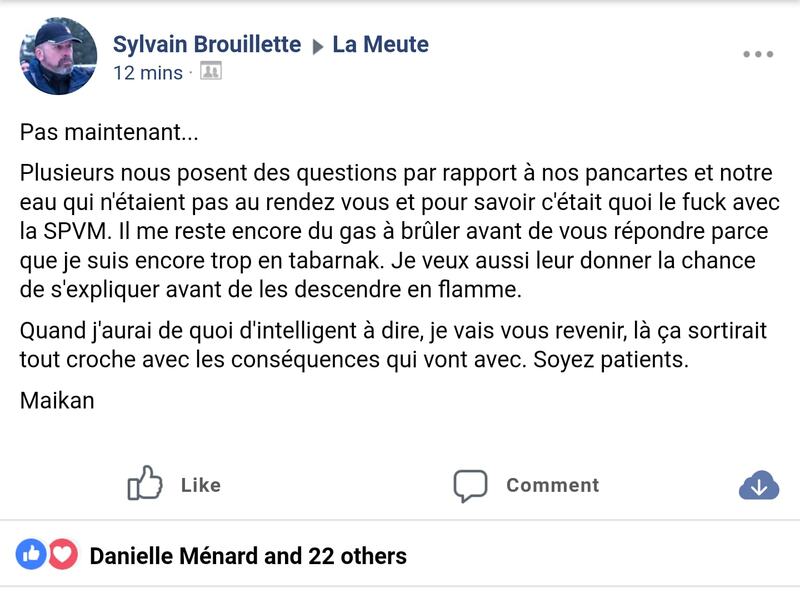 Hatred of La Meute can be pretty intense in some other far right corners, including even threats of violence (the screenshots of which we can’t show right now, for reasons people should be able to surmise). 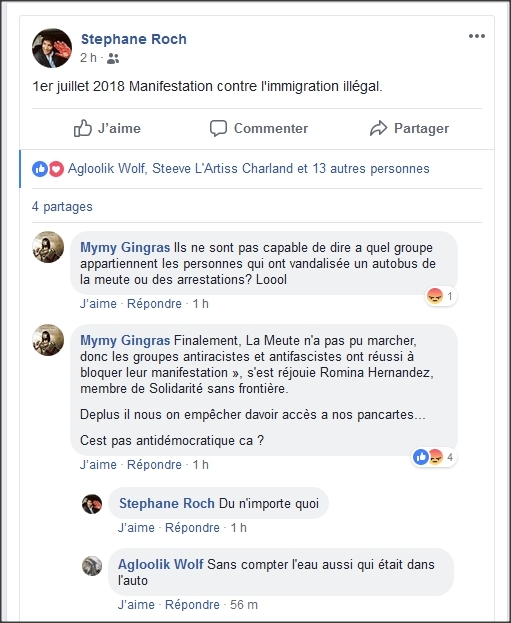 More marginally, members of the Alt Right scene in Montreal (which contains many actual neo-nazis) similarly view La Meute as a bunch of losers. We may have won this battle, but the war of combating the rise of the far-right – here and elsewhere – continues. Make no mistake – their movement is absolutely still growing, their anti-immigrant, racist, islamophobic, and misogynist ideas are still taken seriously, and their rhetoric is still peddled by mainstream political parties, one of which – the CAQ – stands a very good chance of winning the upcoming Quebec provincial election in October. It’s important to celebrate our successes – but it’s even more important, now more than ever, to let them motivate us for the long fight ahead!